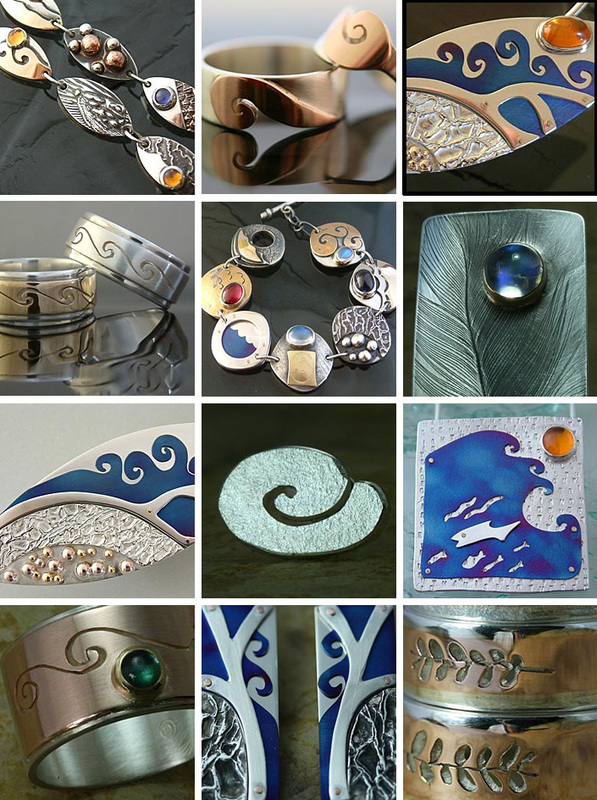 I look foreward to showing you this beautiful jewellery, handmade by Deanna Gracie, New Zealand. Her work have converted me from having no interesse in jewellery, to be absolutely in love with this wonderful pieces of tribute to nature and life. Some of you might have seen her blog, via my blogroll, or maybe her website www.deanna.co.nz/ If not, I recomend you to take a look. You will find more about Deanna, and the prices there. Deanna has allowed me to show her photos, and I have made this collage out of a few. Everyone protected by COPYRIGHT Deanna Gracie. Amazing collection! Real cool jewellery, but what about the price tag??? She does have some GORGEOUS pieces! Yes, it is beautiful. I want to order some one day. Dianna is a very lovely person, and I think that is neccesary for making jewellery which can touch a heart. Why should one wear jewellery if this was not so? Nice shots, I like that creative stuff much more than a rock set on a band. She is a very talented artist and your mosaic is a great tribute to her creativity. I was realy happy to find an artist like Deanna, whom I belive have a direct line from her heart to the beautiful jewellery she makes. Looking at her jewellery is like getting a message about love and respect to life. I´m glad to see, that there are many hits on the post about her, I hope it can give her some buyers. Absolutely. I will pass your nice comment to Deanna Gracie at http://deannagracie.wordpress.com/. Thank you. Her work is simply beautiful—very organic and lots of texture. Thanks for sharing her link! You did a beautiful job on the collage, too, Brigitte!